As the Republican Party implodes over Iraq and Republican Senators are publicly expressing outrage over President Bush’s plan to increase by approximately 20,000 the number of American soldiers in Iraq, Vice-President Cheney has remained firmly behind the President. That’s not surprising since Vice-Presidents tend to be steadfast supporters of the Commander-in-Chief. 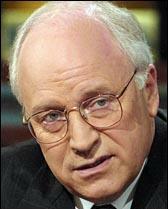 What sets Cheney apart from the crowd is the degree to which he is intractable, arrogant and inflammatory. As a result, the Vice-President stands out as one of the most abject failures in recent political memory. While even President Bush now admits that things have not gone as well as he had anticipated in Iraq and that his Administration made mistakes, the Vice-President recently said that any talk of mistakes or blunders made in Iraq on the part of the Administration was “hogwash.” He has refused to take any responsibility for the quagmire in which our troops have found themselves in Iraq and the myriad of mistakes made leading up to this point. Cheney simply denies reality. If we take the Vice-President’s words at face value that the Administration did not blunder in Iraq, who did? Cheney has not just exhibited excessive stubbornness; he is also unnecessarily inflammatory. For example, rather than being respectful of the majority viewpoint being expressed in the Congress and by the American people regarding the troop buildup and at least attempting to be conciliatory, he said last week that even if a bi-partisan resolution were offered in the Congress opposing the troop increase and supported by a majority of the Congress, “It won’t stop us.” Never mind that clear majorities in the House and Senate are opposed to the troop buildup, that the key military officers have said the increase will not make a significant difference in Iraq, that the American people are against the surge by wide margins; none of that matters to Mr. Cheney. Rather than acknowledge that there is some validity in the opposing view, he denigrates the position and attacks the messengers as defeatists. This past week, the Vice-President again displayed his characteristic arrogance. When asked about the Democratic presidential field, he dismissed all of them outright. Why? Simply because they are Democrats. For Mr. Cheney, if one is not of his political party, if one does not belong to the same social circle, if one simply disagrees with him, that person is automatically wrong and he is right. The Vice-President’s mulish, arrogant, and incendiary ways have played a major role in this Administration and the war in Iraq. Both are miserable failures. So is Mr. Cheney.